Things I do not understand. I have a William Baskwill born in Ireland about 1844, who was in England by the 1871 census and married to someone named Elizabeth, who was born in Staffordshire. Okaythen. I’ve found a son of theirs, Arthur Herbert Baskwill (or Herbert Arthur, occasionally), in the 1939 Register and am trying to figure out who his apparent wife, Barbara, was. Can’t find their marriage, which would lead to her last name. Hmf. But when searching all records at Ancestry, I found a tree with Arthur Herbert in it. And his parents, William Baskwill and Elizabeth Brown. So maybe his mother has a surname, at least. Okay, what sources is this person citing? 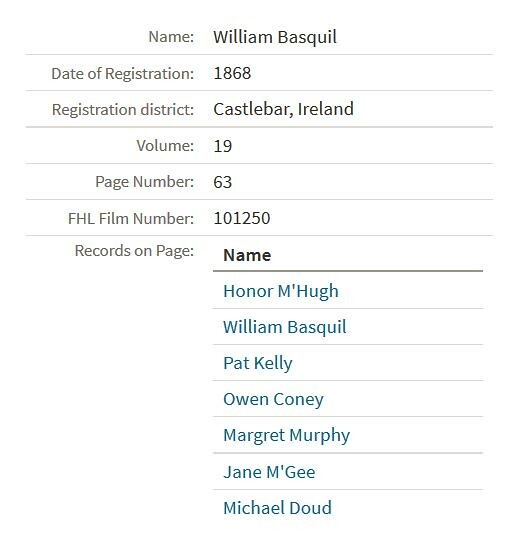 They claim that William and Elizabeth were married in 1868 in Castlebar. Um, no, that is really unlikely if she was born in England. So I look closely at the source this person is citing. It’s from the Irish Civil Registration Index. The only information you will get there are names and the date the marriage was registered. It will not tell you who those people are attached to, or even which people on the list married each other. Sometimes this is still a helpful resource, but you have to use it carefully. I see no one with the last name of Brown, nor do I see any Elizabeths. Why on God’s green earth did this person think this was a marriage for William and Elizabeth in London, England? I spent an hour on that nonsense, chasing it around and around. I even pulled up the parish marriage register for 1867-1868 for Castlebar, just for the sake of thoroughness. Nope. Nothing there, either.